Super PACs Don’t Just Spend In Races For President. Multiple Super PACs Are Involved This Fall In Municipal Races In Detroit, According To Disclosures. LANSING — Detroit Mayor Mike Duggan is riding a wave of financial support into the final days of his race for a second term. Duggan’s campaign and Turnaround Detroit, a Super PAC that’s been running positive TV ads about Duggan, reported raising a combined $1.3 million from late August through Oct. 22. That total dwarfs the fundraising haul of Duggan’s opponent, state Sen. Coleman Young, and the Super PAC that’s been supporting him, Save Our City. Young and Save Our City reported raising about $38,000 in contributions combined over that time period, according to reports due to the city on Friday. The numbers amount to a potential $34-to-$1 advantage in fundraising this fall for the pro-Duggan side of the race. However, Duggan’s campaign has raised about $4 million total since his last election in 2013, according to its campaign finance disclosure. Young’s campaign has raised $52,780 since Young announced for mayor in early 2017, according to its disclosure. 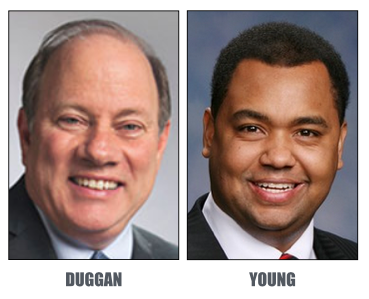 Both Duggan and Young can continue to raise money in the final days before voters head to the polls on Nov. 7. Duggan’s campaign and Turnaround Detroit have been spending heavily on advertising. Duggan’s campaign has reported spending $219,652 on TV and online advertising since Sept. 1. Turnaround Detroit has reported spending $579,129 on advertising and mailings over that time. 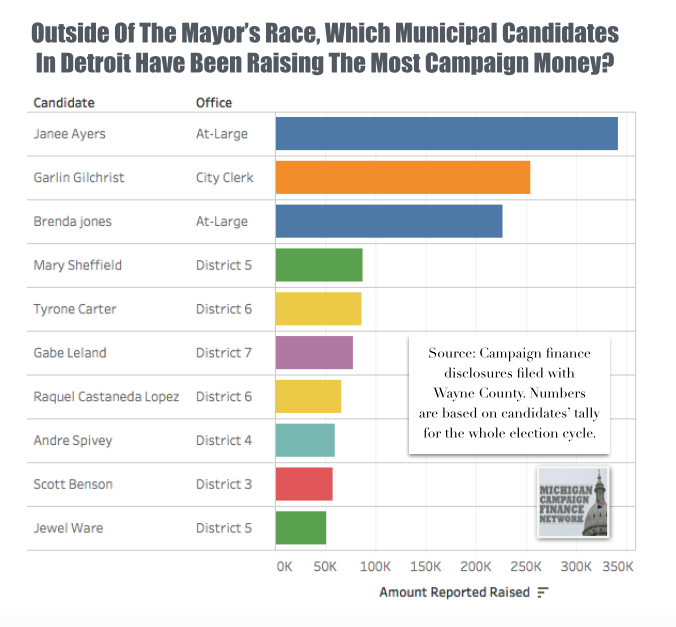 Turnaround Detroit's new disclosure doesn’t mention which races it’s been spending to influence so it’s unclear whether all of the Super PAC’s spending has been focused on the mayor’s race or not. Jason Gourley, the Super PAC’s designated record keeper, declined on Monday to answer the question of whether it was spending money in other races. According to filings with the Federal Communications Commission (FCC), Turnaround Detroit has been reserving airtime on broadcast stations in Detroit. Multiple stations are treating Turnaround Detroit’s ads as issue advertisements, meaning the ads don’t specifically endorse or oppose a candidate. Because they’re not about national issues, some stations aren't providing detailed information about the ad purchases. However, a filing from WWJ says the issue discussed in one of the Super PAC’s ad orders was the “Detroit mayoral election.” Unlike the other stations, WDIV has provided more detailed information about the Super PAC’s advertisements, saying they have referred to both Duggan and the mayoral election. Big donors have been powering Turnaround Detroit. The Michigan Regional Council of Carpenters gave $150,000 over the summer. Since then, Roger Penske, of the Penske Corporation, has given $250,000. Powering the Economy, a Super PAC connected to the Detroit Regional Chamber of Commerce, has given $125,000. And Central Transport, one of Matty Moroun’s corporate identities, has given $100,000. Duggan’s campaign has seen a broader number of contributors with some of the top givers being the Blue Cross Blue Shield PAC, which gave $68,000, and the Michigan Laborers Political League, which gave $43,500, according to campaign finance disclosures. Spending on Young’s side of the race has been harder to track because Young’s candidate committee initially reported $0 in expenditures between Aug. 28 and Oct. 22. Adolph Mongo, who is a campaign consultant for Young, said that spending total isn’t correct and that the campaign plans to amend the report. Young’s top campaign donors include John Ratcliffe, of Texas, who gave $5,000, and Annivory Calvert, of Detroit, who gave $6,696. Save Our City Super PAC reported spending $1,775 on TV advertising between Sept. 1 and Oct. 22 Fred Moore, of New York, gave the Super PAC $5,000 as did Great Lakes Contractors Services Limited. Mongo, a long-time campaign consultant in Detroit, said he’s never seen a race with a fundraising disparity like the one between Duggan and Young. Mongo described Young's campaign as old-fashioned. “We’re still making waves out in the community,” Mongo said. As for Detroit City Council races, many eyes are on a race in the 6th District. There, Raquel Castaneda Lopez, an incumbent council member, is seeing a challenge from Tyrone Carter, who worked for the Wayne County Sheriff’s Department for about 25 years. Castaneda Lopez has raised $65,834 while Carter has raised $86,270, according to their campaign finance disclosures. Carter has given his own campaign $30,000, according to his campaign finance disclosure. He’s also been backed by some larger contributors. The Michigan Aggregates Association has given Carter’s campaign $19,500 while the PAC of law firm Jaffe, Raitt Heuer & Weiss has given $10,000. Supporters of Carter's opponent have been critical of Carter's donor list. “People think I’m the better candidate and they’ve donated,” Carter said in response to those criticisms. Castaneda Lopez has relied heavily on smaller contributors. Some of her top contributions were $2,000 from Tarek Saleh, of Dearborn, and $1,000 from Blue Cross Blue Shield. A Super PAC named the Detroit Community Impact Committee, which formed on Oct. 11, has also been sending out negative mailers about Castaneda Lopez, according to mail pieces provided to MCFN by district residents. 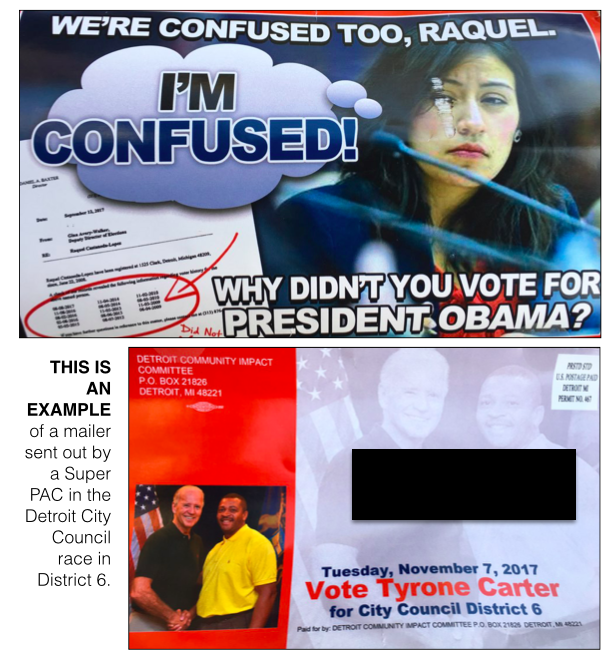 The mail pieces criticize the incumbent council member’s voting record. The Detroit Community Impact Committee reported raising $60,100 from Central Transport but hasn’t yet disclosed any specific payments for mailers against Castaneda Lopez, according to its new campaign finance report. Carter said he didn’t know anything about the Super PAC involved in the race. “I wouldn’t even know what a Super PAC was until somebody told me,” Carter said. Detroit is also seeing a contested race for city clerk between incumbent Janice Winfrey and challenger Garlin Gilchrist, who’s previously worked for the national progressive group MoveOn.org and for the city of Detroit. Since the campaign started, Gilchrist has raised $253,562 while Winfrey has raised only $28,475, according to their disclosures. The United Auto Workers Voluntary PAC and the Michigan Regional Council of Carpenters have each chipped in $20,000 for Gilchrist’s campaign. Former NBA player Shane Battier gave $4,000. Joyce and John Floyd, of Southfield, have been among the big givers to Winfrey's campaign. They gave $4,550.